Hello Alterna-Fringe dwellers! I'll be you knew I was going to say that? And how fitting on an episode about scientific predicting, right?! This season has been on fire. I am enjoying every minute that we are spending with our Fringe favorites, both NORMAL and ALTERNATE. I liked the twist we got with Olivia "OVER THERE" this week. There is still a little bit of her trying to find her way back. Love it! But, even with advancing the personal stories, they still found a way to fit in another FRINGE CASE of the week. 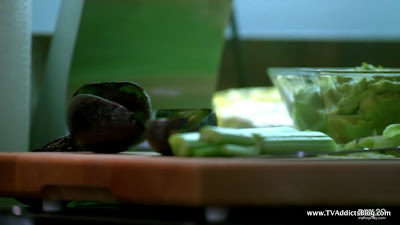 And using advanced technology OVER THERE to its advantage, it made for a very interesting and suspenseful time. As far as recaps go, I think I will mostly try to stick to the ongoing story for discussion purposes. But we'll touch a little bit on the CASE as well. Here we go! Long story short, there is a guy that has been injected with "smart genes" or something and they gave him too many treatments. He is now able to calculate all kinds of data and figure out how events will transpire. He can even predict his sister's thoughts (except for crazy little toy horses). For some reason, he finds enjoyment in setting up intricate scenes involving many people in a crowded area. And it all results in someone getting rammed into by a bus, ambulance you name it. 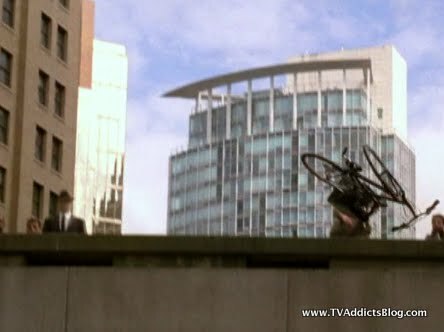 When Olivia was catching on to him, he was even able to secure his own getaway vehicle by throwing a bike over an overpass. Thus, we have FRINGE come in for the investigation. Some things to note. I was under the impression that OVER THERE Fringe Division was primarily responsible for quarantining "tears" in their universe. 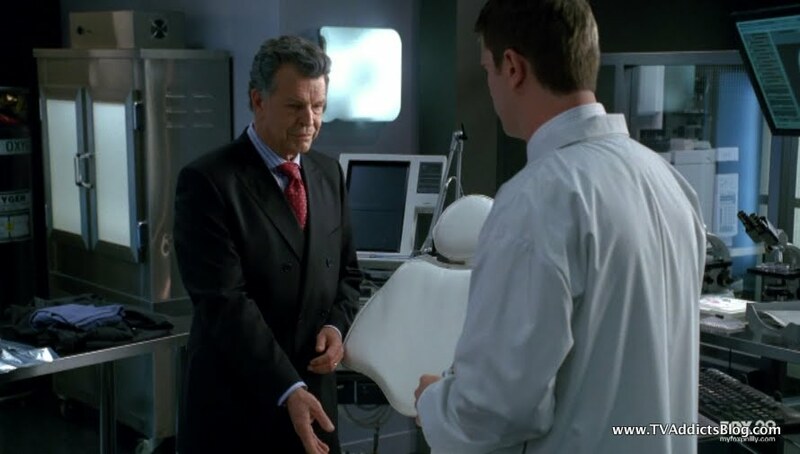 Of course, that was the first thing that they looked to do when they got to the crime scene, and it was the first thing that the hospital thought they were there to do when they showed up to question the doctor. I'm early on this in the blog post but it's pretty cool to note that there is no use for ball point pens in present day alternaland. And thinking back, I don't recall seeing one last season or this season. I thought Olivia was kidding at first when she said she hadn't seen one since pre-school but it makes sense. They're so advanced they have no need for paper. Of course, the crazies still write stuff down at the hospital. And of course, there is that typewriter that types through dimensions! So anyway, the Fringe team is able to track down Milo (I think that was his name) but he still had everything planned out. 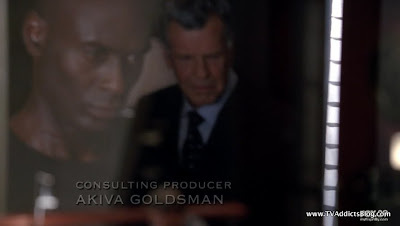 What he didn't count on was that Olivia might not adhere to protocol. THAT'S RIGHT! There is still some Olivia left there to rescue. She was in an oxygen light area and there was a sign that lit up telling you to get out your portable oxygen tank and breathe! Olivia kept running and avoided death by cinder blocks! Milo gets locked up to talk to a computer for the rest of his life. 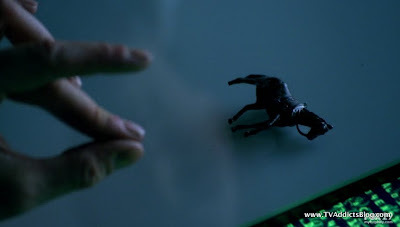 But no fear, he has his little horsy! Case Closed. It seems like everyone in "over there" land are decent people. They all just are trying to protect their world from being destroyed. And maybe that is Walternate's plan as well. But, they certainly are being clear that he is the villain in this story. 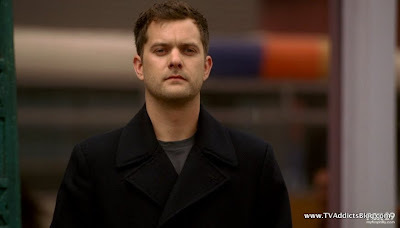 He has a little sit down with Broyles during the episode to check in on Olivia's assimilation into the Alterna-Fringe Division. Walternate states that after a certain period of time, these Faux-livia hormones or whatever will take over in our Olivia for good. This would explain why throughout the episode she was seeing visions of Peter and OUR Walter. 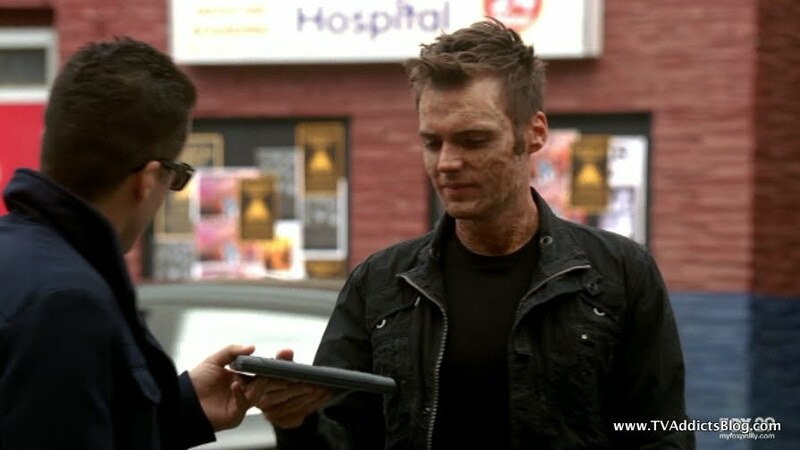 Walternate explains to Broyles that their plan is to learn from Olivia everything they can about crossing worlds safely. And when they're done with her, she's of NO USE to them anymore. Bad Bad dude. 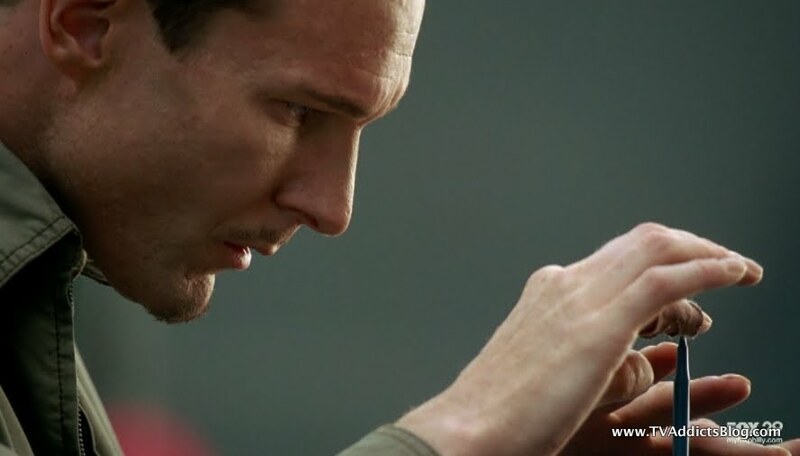 Even Broyles was saying "then we can learn how to defend our world" or something like that. No, I think Walternate wants to DESTROY our world! So Alterna-SCIENCE GUY (Brandon) has been working on what will send Olivia back to the other side. He has some of Peter's clothes to act as something familiar to her. But, he is still having trouble figuring out what to do. Walternate suggests submerging Olivia in a sensory deprivation tank. Ahh, remember the pilot episode of Fringe? Of course, I don't think she was crossing dimensions at the time. But Brandon suggests that it would provide the ultimate state of relaxation. Brandon asked Walternate if he missed being scientist, after he solved the riddle with such ease. Walternate said he still IS a scientist with just a much bigger lab. Touche'. She definitely got a download to her brain of Fauxlivia information that pretty much goes as far back as Faux-livia's memories can go all the way up to the bait n' switch. But at times, she sees things or doesn't know things that she should. 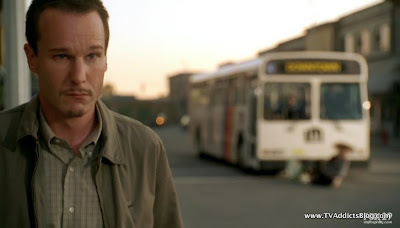 First, during the case investigation, she sees Peter across the street. He's not REALLY there, but he is in her head. She told her boyfriend that she saw him. And from the discussion, it proved that Olivia's memories go all the way up to that day when Faux-livia met Peter. 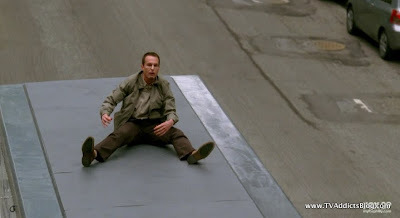 But it didn't stop there, she also saw "crazy nuthouse" Walter in the hospital. Visions galore! Charlie and Lincoln Lee (who is healing nicely, I guess. Was pretty cool effect when his face started degenerating due to being out of the hyperbolic chamber too long) had a discussion about Olivia vs. Faux-Livia. Lincoln was making fun of Charlie for being fooled by Olivia. And apparently, Lincoln has a history with Faux-livia. They kissed one time while she was dating the other dude. Hmmmm Anyway, Charlie brought up suspicion that possibly this really IS Olivia from OUR world. But then laughed it off as Lincoln didn't buy it. When Olivia didn't remember the code to talk to witnesses on their touch screen bluetooth crazy talk center, Charlie gets suspicious again and brings back some memories from Coney Island and changing the facts a bit. Olivia passes though. But, of course, as we mentioned above she did not remember to get her oxygen tank out which actually saved her life. This was a fact that HEAD Peter (ahh BSG memories) brought up when he returned to Olivia and TALKED to Olivia. He said that by not knowing the protocol, Milo couldn't predict her moves and this therby kept her alive. Peter also told her that she needs to hold on to those memories and that she is not from this world. And of course, then he planted one on her. Or she dreamed of him planting one on him. In either case, it left a lasting impression on her after her "boyfriend" left for Texas. I'm loving this though. I actually didn't think they'd be showing Olivia remembering things so soon. But they switched it up and made it so she will remember things UNTIL she plateaus and then she'll remember nothing. Well hopefully her head characters and cab driver Henry will help keep her in her place. And someone is gonna have to get her out of there before she his the plateau! So that's pretty much the episode but there, of course, are the little Easter Eggs and stuff that they throw into the show. No Walterisms this week but that gets replaced with the little nuances of OVER THERE. Hoboken, NJ - Well I had to mention that they were investigating Hoboken at some point. 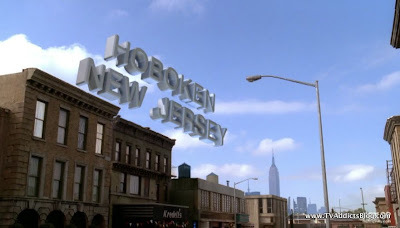 Besides things noticed in the Hoboken scenes, the town itself didn't seem much different, did it? Surprisingly, I've never been there even though I'm only a couple hours away. Aruba War Vet - Anyone catch the homeless guy who was a veteran of the Aruba War? That was pretty nuts. Is this a replacement for Vietnam? Or just something comical to throw in there. I'll opt for comical! 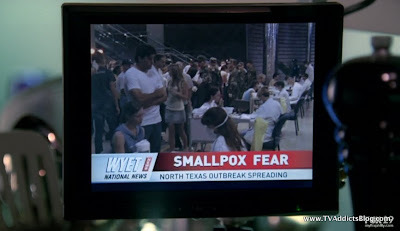 Smallpox - So, they're advanced in technology, but I think our world has medical advancements that they desire. I mean, Smallpox in North Texas? That is insane! And apparently Faux-livia's Man is a doctor-hero type guy that is always on call to help in these situations. Air Quality issues - As we mentioned earlier, there are definitely some issues with air quality in this universe. There are even signs that light up prompting you to use your oxygen tank. And it was their first concern with getting out in Hoboken but the area was cleared as BREATHING-friendly! We don't know if this is caused by the tears in their very existence that Walter created or not. Pens - Besides being an awesome device to set up Milo's elaborate death tricks, Pens are practically extinct in this universe. I got ahead of myself above, so I won't continue to elaborate. But, the more we see iPads and other tablets gaining popularity, perhaps the eradication of writing tools isn't too far in our future either? Maybe. Let's just not over pollute and leave the planet one day and have one robot stay behind to clean up the trash okay? 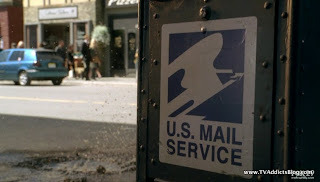 Mail Service - We may have seen the U.S. Mail service logo before but it's definitely not the Eagle we're used to. I couldn't even tell you what it is! What was up with Charlie injecting something into his arm? Maybe there's a story I forget or this is setup for one coming? 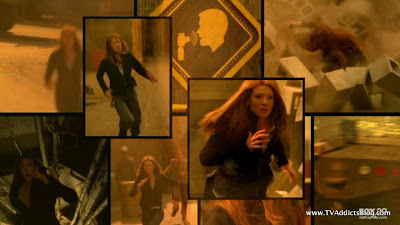 Fringe Glyph Code - BREACH Last week ALERT, the week before AMBER. Some people are suggesting that maybe Amber Alert is meant to suggest that maybe Olivia's niece will be kidnapped. So then what does BREACH mean? I guess Faux-livia is a breach in OUR Fringe Division. I guess the glyph codes are fun, but they don't really add much for me. But I'll keep posting them! Observer - SPOTTED! He was on the bridge when Milo was up there plotting his next move! And that's a wrap for this week folks! Another solid episode of a so far solid season. If they can keep this momentum up all year long, then I do not mind them keeping the Olivias switched. But if they're already talking about Plateauing and sending Olivia back to the other world, maybe they have something in store for November Sweeps! But, I can only guess at this point. I leave it to the experts as they're doing a fine job so far. Aruba war vet, I laughed when I saw that!Didn't see the observer, keen eye you have Mike! 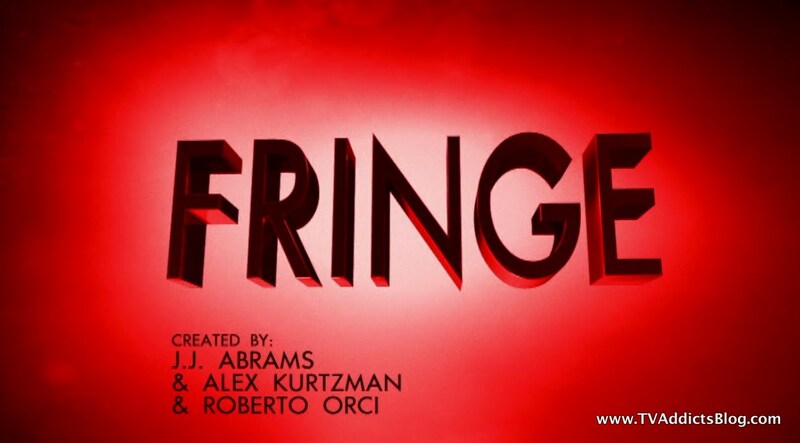 I enjoy Fringe, don't know where they are going with it, and like the ride! Where are you getting the glyph codes? Haven't noticed or heard of them. Breach. A tear in the Universes? A breach birth? A violation of the rules? Interesting! Thanks for the quick recap! Have a great weekend! 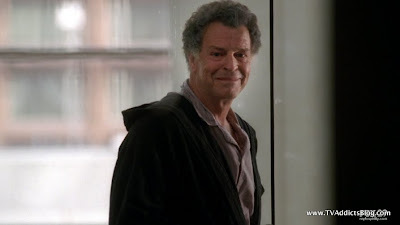 I'm the same way...loving the ride of Fringe. I still am not sure if these recaps are worth it or not. There's really not much to write about besides some Observ(er)ations! You're welcome! Have a great weekend to you too! I'm not into the secret codes but Amber alert breach to me could mean breach in that amber shield they put up ! This is def one of their best seasons so far. As for Charlie - they have teased hm several times about worms when he takes his shot and he always corrects them that it's not worms but something else. Can't remember what. Totally agree that this season is on fire. And the thing is...we never would have been able to get to this point without going through season 1 and 2! I know that sounds pretty obvious but I'm just saying they did a great job building to a point where this scenario is plausible. I'm loving it! Thank god you mentioned Battlestar because I mean..Ron Moore has to sue JJ Abrahms right? I def didnt notice the Aruba War, that was awesome! AuStarWars - Yeah, totally agree that the MOTW was awesome this week. Actually, most weeks they are pretty good. That's the beauty of Fringe! I read Ken Tucker's EW review and he's comparing it to last year's White Tulip (with Peter Weller)....also a fabulous episode. I know you weren't implying this but I didn't mean imply myself that I don't care for the MOTW storylines by just breezing by it in the recap...I just don't see much value in breaking it down and explaining it. Plus, I'd probably end up showing why science was my worst subject in high school! lol I love Science Fiction, but studying science? eh...not so good at it! But yeah...the uber-intelligent Milo was a good time. And I never read that book, but sounds like it would be a good one. Aruba War is definitely a good time! Thanks for the info on the Charlie Worms too...sounds very familiar as I mentioned to MJ above as well. I didn't think about it from that perspective though...some similar cases remaining unresolved. Good stuff, X-Files ripoff or not! One day, I'm gonna have to rewatch these episodes from the beginning. I wonder if it would be hard trying to rewatch season 1 now knowing how far the show has evolved! Didn't even occur to me until I read it somewhere else...when they mentioned North Texas they were referring to the STATE of North Texas. 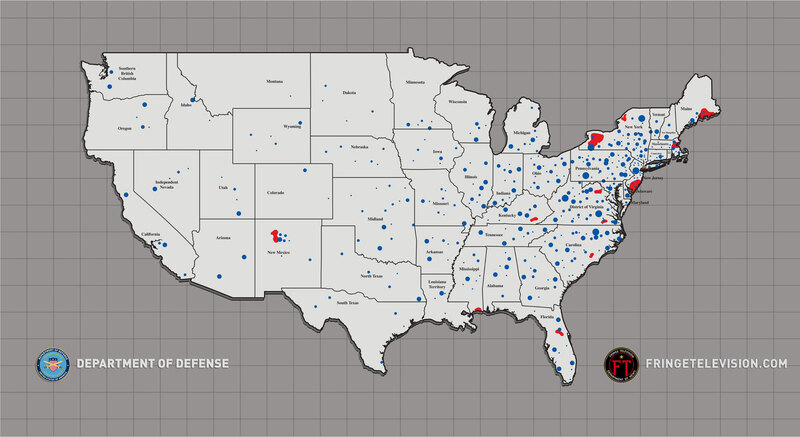 Based on the map shown in the season 2 finale, there are differences in the OVER THERE US. California is half sunk...Virginia is the "District of Virginia" and Texas is divided in 2. Let me throw something out there...I have a feeling that the "stealing of Peter" is not actually the reason for everything..sure it may have accelerated the degredation of their world, but we know that Walternate and other uber scientists were still that: uber scientists..so i really think in the end it will be revealed in other ways that various experiments are really responsible for the differences in our world..clearly there had to be some cataclysmic shift that occurred (like someone assasinated Hitler or any of those "typical" time travel kind of things written about)..and this Peter shifting is just another cog in the wheel..it just seems to me to have too much going on for such a seemingly small Butterfly Effect to have ocurred.. I have no idea...I read a lot of stuff in school! lol If I did, I forget the story! That's actually a good theory...and it would be awesome to have some redeeming factor for Walter in all of this. He can't be the downfall of a universe! BTW, I just read an interview with the actress that plays astrid (i think on tvovermind.com it was a tweet on my phone lol)...anyway...she stated what I had been guessing...they're going to have us rooting for both sides by the end of this season. Not knowing who is good vs. evil. Of course, Walternate still seems like a total DB! More support for your theory would be that OUR universe is FINE and it experienced the universe shifts also....so what is THAT about? I think they're not going to introduce a 3rd universe in this world....2 is probably enough to get the gist of it! Oh he hasnt been involved in a while, other than saying in the beginning "man wouldnt it be cool to redo that Chris Carter show from the 90s and just copy everything they did".. 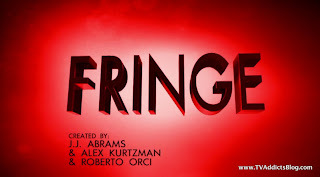 I don't think it was a secret that Fringe was modeled after the X-Files though! I would argue that the show has come into its own. But yes...definitely inspired by its predecessors! I’ve finally caught up through season 2 and can comment on the new episodes. I’ve already started rooting for both universes. I agree that alt-universes people seem like good people, just more solder like, following a evil leader, Walternate. And I like AUStarwars’s theory, but to just expand on it. 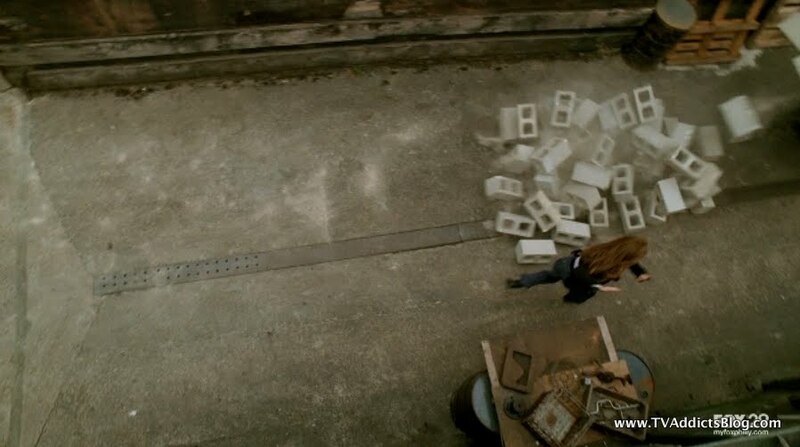 I don’t think stealing Peter caused all the destruction to their world. It was Walternate’s continued failed attempts to break into our universe that caused the problems. He’s just now blaming it on Walter. Perhaps instead of trying to go there himself he used Peter’s DNA in his experiments to just pull Peter back to his world. None of them worked which is why they now need Peter to power the device and save their world. I’ve missed thinking of crazy theories. So, the more I think about AUSW's theory (I need a shorter way to say your name or I'm just going to start using your actual name! lol), didn't William Bell ALSO tell Walter that he was the cause of all of the destruction OVER THERE? Perhaps William was in the dark too? Bell did say that. And if Walter didn’t travel to the other side, Walternate wouldn’t have tried to get Peter back, which is causing the destruction of his world. Walter is responsible, just not as directly as they’re leading on. Right, that's kind of how I'm looking at it too. 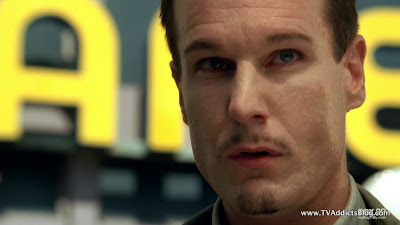 There has to be at least SOME kind of redemption for Walter's character. Yes, he may have initiated the mess but I agree...Walternate probably made it worse. Then again, Walternate has been under the assumption that Walter kidnapped his son making him view WALTER as an evil person. I really need to watch these awesome eps from season 2 again, but I believe we found out that it was Walter's WIFE that begged him to KEEP Peter, right? 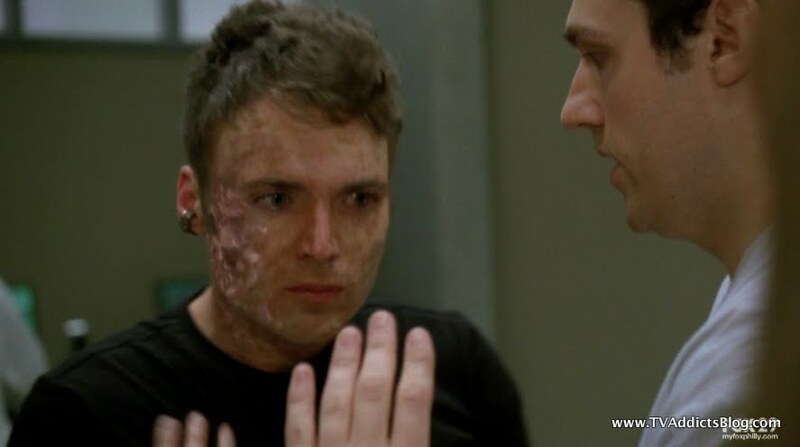 So, I guess there is a chance that if Walter was able to bring Peter back after he was cured, there would be no issues at all. I like your idea of using Peter's DNA in failed attempts, which is why he is needed to power the machine. Good stuff! Can't wait for Thursday! Then I think we'll be getting a Fringe Hiatus with the MLB playoffs going on. Charlie was bitten by man-made chimera in season one, episode 16 and is injected with the creature's larvae. 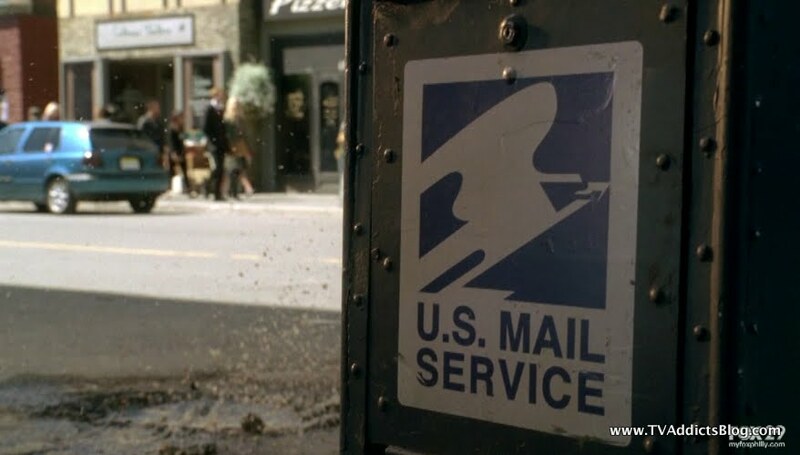 Olivia, Walter and Peter track the creature in the sewer and obtain a blood sample, enabling Walter to devise a cure to kill the larvae inside of Charlie. Peter was instrumental in the discovery of the make-up of the creature's ancestry. I believe the creature was part lizard, part wasp, part bat, and part lion. Welcome Cajun!! I guess I just assumed it was Walternate typing on the other typewriter....I guess it could be Alterna-Brandon too. Other than that, there aren't many people in the loop OVER THERE on what their plan is, so it would most likely be one of them! Enjoy the recaps and season 3!! It's a great season!